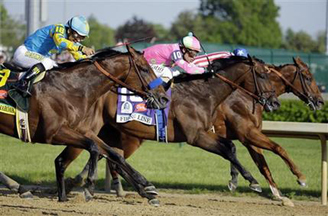 BALTIMORE (AP) — Kentucky Derby winner American Pharoah will face seven challengers in Saturday’s Preakness. Vying to become the first Triple Crown winner since Affirmed in 1978, American Pharoah will part of the smallest Preakness field since 2000. Trainer Bob Baffert has two entrants: American Pharoah and Dortmund, who finished third in the Derby. Firing Line, who took second in the Derby, is also entered. Firing Line has come in either first or second in all six of his career races. The other horses in the field are: Bodhisattva, Danzig Moon, Divining Rod, Tale of Verve and Mr. Z.
Danzig Moon finished fifth in the Derby and Mr. Z, who is trained by Hall of Fame trainer D. Wayne Lukas, was 13th. Preakness odds and post positions were to be announced later Wednesday.